What’s the best child care money can buy? One morning in May, an almost 2-year-old with dark-blond hair named Marin arrived at “school” around 8:30 a.m., a shiny unicorn-shaped backpack on her tiny shoulders. She wore the disgruntled expression of someone whose morning had gotten off to a bad start. In Marin’s case, that was because of an “accident” she had had on the way to school—an accident that now meant changing out of one of her favorite pairs of pants into leopard-print leggings she didn’t like nearly so well. Marin’s crankiness perturbed no one at her school, the early childhood program of the century-old Bank Street College of Education on Manhattan’s Upper West Side, called the Family Center. Respecting the emotional ebbs and flows of even its youngest of learners is a crucial component of the center’s distinctive approach. Unlike far too many child care centers across the country, the Family Center treats its charges like serious learners while also respecting the fact that they are still young enough to wet their pants on occasion. The center enrolls about 60 children from six months to 5 years of age, a quarter of whom, like Marin, are just about 2. Classes are divided into two mixed-age groups: one set includes children 6 months to 2 years and 8 months, and the other focuses on the older kids. * Founded as an experimental nursery school in Manhattan’s Greenwich Village, Bank Street was conceived as a laboratory to find the ideal environment for young children to learn (it has since moved uptown). * In addition to its nursery through eighth grade program, Bank Street hosts a graduate school that trains adults to become teachers. Still, it’s an interesting window into how money can be best spent. We made two visits to the Family Center in late spring and interviewed parents and teachers alike. We identified five central parts of the program’s approach that help it excel and could be used to improve early learning in programs around the country. By almost any point of comparison, Bank Street pays its teachers well. The head teachers who anchor each classroom make more than $60,000, although school officials declined to provide additional specifics. By contrast, Early Head Start teachers rarely make much more than $25,000 a year, according to experts and a report showing their hourly wages. “We believe strongly in the importance of compensating teachers for the education and skills they bring to their critical role,” says Jeannette Corey, the program’s director. At the Family Center, every head teacher must have at least a master’s degree in early childhood education, whereas assistant teachers need at least a bachelor’s degree in a related field. By contrast, Early Head Start teachers do not even have to have a bachelor’s degree, and the standards for caregivers at scores of unaffiliated day care centers across the country are typically low—with just a high school diploma and some short training courses considered sufficient. Each of the Family Center’s four classrooms, which contain mixed age groups ranging from 6 months to 3 years, has three or four adults for an average of 10 children (some kids are enrolled just part time). Besides the head and assistant teachers trained at Bank Street, there are typically aides and interns, some of them working toward degrees in early childhood education, who provide support. Channing Edson said her extensive training included spending a year as a student-teacher, during which she had weekly meetings with fellow trainees and faculty members to share their experiences in the classroom, reflect, and solicit feedback. “It was a powerful therapy,” she says. During years of training, Edson took courses on variations in the way young children develop. The focus was on both theory and hands-on implementation. She learned, for instance, that a game as simple as peekaboo can provide important learning opportunities when teachers use it to explore the concepts of going away, coming back, and the typically temporary nature of separation. Edson is now continuing her studies, pursuing her master’s degree in child care center administration at Bank Street. At the Family Center, each child is paired with one staff member who becomes her main point of contact until the end of the program. If a child has a meltdown, this person might be called to help calm her down. This is definitely a role that Edson has played for Marin from time to time—comforting her when her mom leaves in the morning, for instance. “Decades of research show that children develop best when they develop a trust,” said Takanishi. It also helps cut down on the crying quotient in the room—at least sometimes. When Marin entered the classroom the May morning that I observed, she encountered a tub full of thick grass, colorful plastic bugs, herbs, and fresh flowers. There were also teddy bears, dolls, books, a stethoscope, empty cans, cubes, and a roll of tape. Part of the Family Center’s core pedagogical philosophy is that young children learn mostly through play and experimentation rather than formal instruction—and that it’s best when that learning takes place with real-world action rather than through a television or iPad. The most everyday objects can become fodder for learning. Empty chickpea cans become drums and a way to discover the sounds made by an empty object. A roll of tape can become a way to learn the difference between sticky and smooth, and how to keep hands clean. Marin played that morning with a handful of paper tissues, using them to wipe dolls and clean plates. While playing “house,” she learns new shapes and how to use her imagination, transforming a block into a phone, or a stick into a fork or spoon. Observing Bank Street’s rather Spartan classroom setting, it’s clear that free play time doesn’t mean leaving toddlers alone with a monstrous stack of toys. The environment is set up intentionally, with a range of interesting objects for the students to discover, some of which rotate out on a seasonal basis. For instance, there’s a homemade interactive “sounds” panel, built with a metal pencil holder and two maracas among other objects. Nearly everything must serve an educational as well as a “fun” purpose. Teachers serve as facilitators and guides for the children in their explorations, helping to ensure that they glean the most from their playtime and don’t sit idle for too long. The staff members intervene and propose activities when a child looks bored or needs to be distracted. “Want to learn with me the names of insects? Look at this grasshopper,” said a teacher the morning I observed, handing a plastic insect to a toddler whose father was leaving the room. At more poorly resourced centers that can’t afford to hire enough support staff—much less trained support staff—such interactions might fall by the wayside. 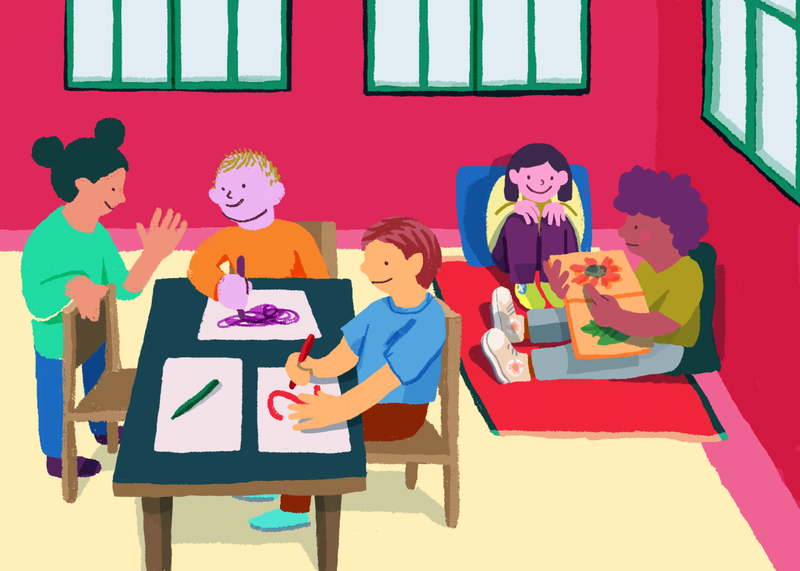 In recent years, some preschools have shifted away from play-based activities in an effort to emphasize formal academic instruction, partly in response to fears—from parents and educators—that kids won’t be ready for kindergarten. But especially for toddlers, according to experts, learning should be embedded into the play activities. Otherwise, it’s akin to handing a child a book without taking the time to teach her how to read. The Family Center teachers seem never to stop talking. That’s by design. “Now I am moving this chair so you can sit safely,” an assistant teacher tells Marin while helping her join classmates at one of the tables. A sentence like this might seem simple, but it’s doing a lot educationally for 2-year-olds: providing instructions, stressing the importance of safety, making a distinction between you and me, and helping teach vocabulary. An instructor without this training might have simply said, “Sit down,” motioning at one of the chairs. At the Family Center, they narrate meal preparation, diaper changes, transitions, and more. Adults’ conversation can teach toddlers that they have a voice, too. “You can say, ‘I need space,’ ” said a teacher to a child who appeared uncomfortable with two classmates playing too close by. Marin didn’t say much that morning beyond an occasional word or phrase. “Off,” she declared at snack time, for instance, pointing to the paper wrap for her blueberry muffin and looking at a teacher. But she is an attentive observer, and it was clear she was listening and taking in words. Marin goes to the center three days a week, and her mother works there four. Like roughly 25 percent of the center’s families, Felman is employed by Bank Street, where she works as a special education teacher. She also offers “play workshops” for parents who want guidance on how to teach children through play. If Marin weren’t enrolled at Bank Street, she probably would have stayed home with the nanny who took care of her for the first 16 months of her life (and still does one day a week). Two-year-olds are famous—or infamous—for what’s known as “parallel play”: staying in their own little universes even as they play side by side. But this activity isn’t as solitary as it may seem. Parallel play is in fact the first form of social interaction for toddlers. By playing next to each other, children see what others are doing from a “safe” distance, and when they’re comfortable enough, they begin socializing more directly. Teachers at the Family Center try to draw out their budding social natures whenever possible. They suggest that the children interact by exchanging objects or helping each other. They also teach them how to express themselves in front of the other children as well as how to encourage others. For example, every morning during the circle time, teachers invite each child to dance, each kid choosing whether to accept. Charlotte, who turned 3 in mid-April and has been in the same class since she was 6 months old, is the first to be called. She accepts and dances while her teachers and friends sing: “Children, there is a friend that we all know, Charlotte is her name. Charlotte get up and dance, Charlotte get up and dance. Charlotte and Charlotte is her name.” Today, Marin is the only one who doesn’t feel like dancing, but she offers her teddy bear as a proxy, holding him by the paws while he dances on her behalf. At the Family Center, the older children are encouraged to take care of the younger ones. Charlotte is clearly aware of her responsibilities as one of the older children in her class and doesn’t refrain from helping the little ones sit in their chairs, making sure that their belt buckles are locked when needed. The morning that I observed, Charlotte prepared an entire pot of imaginary Nutella for a younger friend and gave Marin a puppet. The kind gesture made Marin laugh aloud in an explosion of joy. The “accident” of the morning had become a distant memory. Once a week, parents are invited to participate in a one-hour workshop that teaches them how to play with their children in the most educationally enriching way. (Parents whose children attend the school are invited, but these sessions are open to any parent. )* Here, parents can learn, for example, what potential many common household objects have for play and learning. “We make sure that parents feel heard and that there is no question off the table,” says Felman, Marin’s mother and one of the two educators in charge of the group class. Like the majority of high-quality child care centers, Bank Street communicates regularly with all parents about their children’s progress—or meltdowns. They try to provide parents with as much detail as possible about different activities so that they will know enough to ask things like, “What song did you dance to today?” The center used to communicate primarily through handwritten notes but is now developing an app that allows them to share comments, photos, and videos, and preserve the memory of special occasions, like the day Marin turned 2 and her mom helped her blow out the cake candles during snack time. Some of what Bank Street does is inaccessible to the average child care center, which has nowhere near the resources and qualified staff at its disposal. Cash-strapped centers, for example, can’t just suddenly start requiring that their staffers hold advanced degrees. But there are also parts of the Family Center’s philosophy that can provide guidance to any child care center—indeed, there are likely parts that already do. Centers should be deeply educational, and even the youngest children are capable of tremendous learning. Classroom setups that gently encourage self-directed play could help prompt changes throughout the industry. Forming strong bonds with parents and making sure there’s open communication about progress can also help. Constant narration may feel overzealous, but it’s a step anyone can take to improve the learning. Historically speaking, child care programs and educational preschools have not been considered as the same thing. The former had been conceived in order to give working moms a safe place to leave their children, even all day, but they did not often focus on an educational purpose. The latter, particularly when they serve children under the age of 3, are too often luxury goods accessible mostly to those with considerable financial resources. By combining the ethos of both, we can work to build a better system for every 2-year-old.